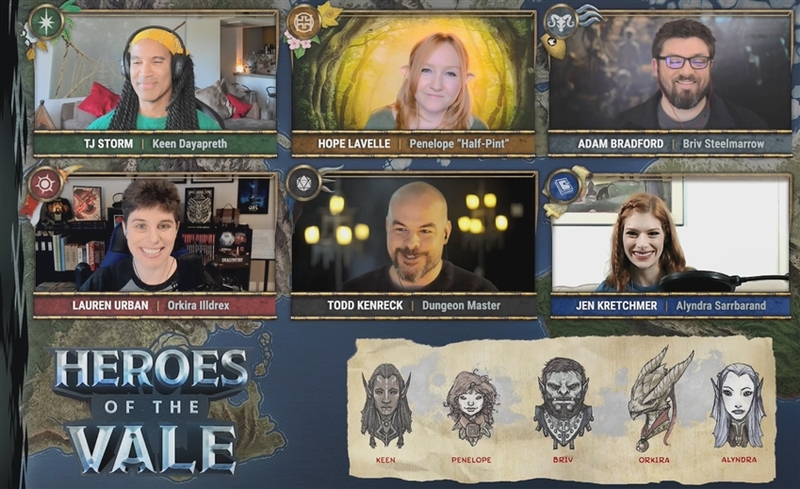 Heroes of the Vale Recap Ep 4 "Spit Portal"
"Before we learn about all kinds of new crazy creatures that probably want to kill us...I mean I'm still working on the gnomish city that attacked Penelope...one thing at a time!" 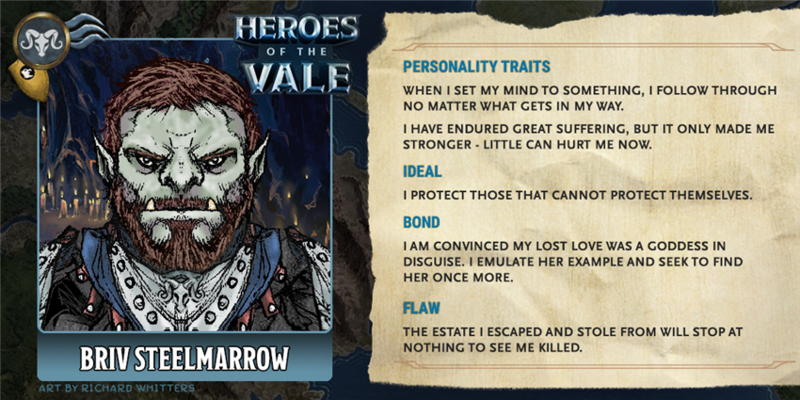 Watch Heroes of the Vale: Episode 4! As the team scrambles after Briv, he watches as the water drains away and is suddenly at home with a women he calls "Ardenia." Briv's joy only lasts a moment, however, as he hears a storm of knocking and scratching at the house. Briv prepares to protect Ardenia, asking how he can help. She replies, “Briv, how can you protect us if you are on the inside? How can you protect our home if you are inside our home?” Briv heads to the door and kicks it open, feeling an overwhelmingly powerful presence. Something attacks him with radiant damage, burning him, and Ardenia starts to scream as she is hit by this light. Outside the pool, Keen switches to his Summer form in a flash of light, catching fire in anger. He ties a rope around his waist, hands the other half to Penelope, and dives into the pool! Penelope manages to tie the other end to a tree JUST in time, and Orkira and Alyndra grab hold for extra support. Briv rushes outside into the bright light, but suddenly is back in the water being pulled out by Keen! The group hold him down, preventing him from running back into the water, until Briv finally snaps out of whatever dream he was caught up in. He says he saw someone from his past, but doesn’t want to talk about it. His companions understand, offering support and healing, and one of the Flumphs from earlier appears to also offer comfort. Looking around this pool feels like it’s wrapped up in something primordial, giving everyone a bad feeling. Briv threatens the pool, stabbing his sword into it and announcing, “If you choose to come face me, you can find me in Fallcrest.” Alyndra casts light on a stone and drops it into the pool. It drops deep though the water, illuminating a cavern filled with thousands of bones. A graveyard. The group quickly heads away, returning to Fallcrest. But as they approach the town they can see Fallcrest is engulfed in flames! Thick smoke billows from the buildings, which are still smoldering from a previous attack, and most of its citizens are gone. The few bodies they find are of guards who appear to have been bludgeoned to death. There are footprints marching out of town, many from townsfolk but also larger prints that cannot be identified. Griff follows the tracks and cannot find any creatures, even all the small animals are gone. All of the prints lead to a single point outside of town and disappear. Alyndra can feel a tear in the Weave, something similar to the rift she leapt through when she joined the party. She explains that there are ways through to different worlds, and believes that is where the town has been taken. Examining the footsteps leading out of town they find the path is soaking wet and covered in hundreds of small runestone. 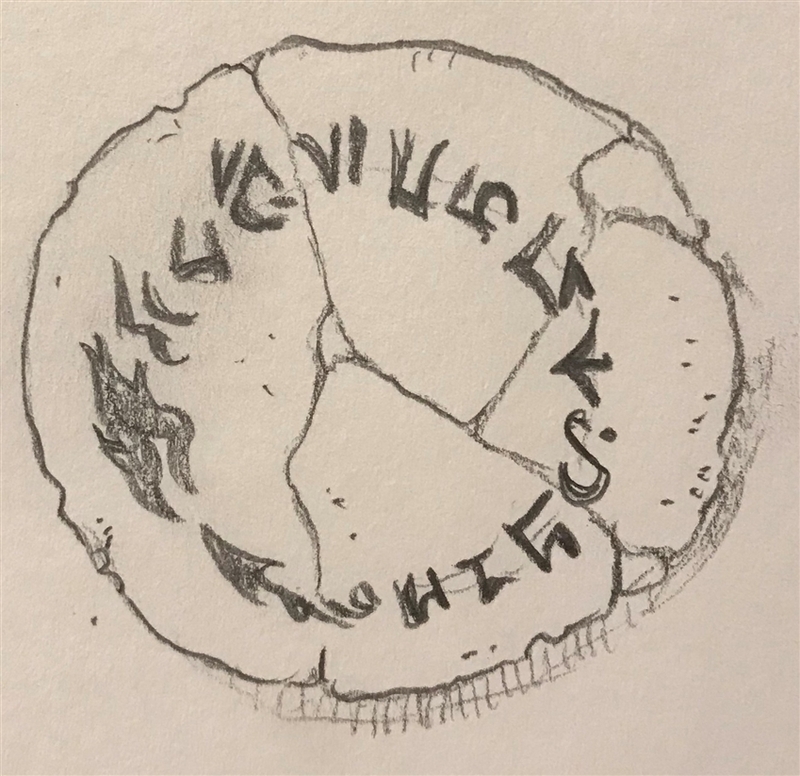 They are inscribed in Primordial symbols, one shaped like a barb and the other like a Dragon’s mouth, that together form a symbol that Alyndra has seen in her travels. She can translate it to mean “passage” and a name, but she cannot speak the name. While Alyndra tries to puzzle out the runes, Keen sits down with his glaive and removes the ruined blade. He manages to take the blade from his Gith sword and use it as a replacement. Briv sits to sharpen his weapon and examine his newly stronger shield. Orkira and Penelope take a walk through the remains of the town, hoping to find some more clues or anyone alive. As they search, Orkira is drawn to a strange, towering flame in the center of town. A voice she has never heard of before calls out her name. When Orkira responds, Penelope is confused and does not hear or see anything. Inside the flame Orkira sees a tall women with blond-gold hair exuding peace and comfort. 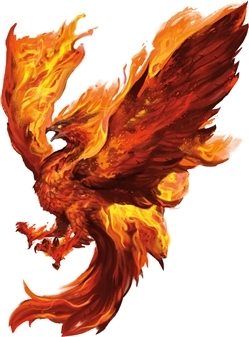 She calls herself Saranthis, the Bringer of Light and Flame, and exclaims “You need to save them, your people!” When Orkira agrees but admits she doesn’t know how, Saranthis replies, “Look into the thing that would extinguish us.” and then vanishes. Orkira tells everyone what she saw, and Alyndra says it sounds like one of the newer goddesses from her home realm. Alyndra has managed to put together the runes in the correct way but doesn’t know how to activate them. Acting on Orkira’s vision, Briv comes forward and spits on the rocks. That turns the runes on and creates a shimmering portal! Orkira takes this as a sign that this goddess of fire really had given her a sign and a directive, “Come on Keen, a Goddess has sent us on another adventure!” and happily jumps into the portal. Briv is quick to join her. The rest of the group are more hesitant, but eventually follow. Orkira suddenly wakes up from this dream/vision, climbing out of a pool of water surrounded by her friends. They are now on open grassland close to the edge of a swamp, two suns shining in the sky. Orkira takes a moment to pray to Pelor and feels not just his power but a second warmth; Saranthis is also here offering welcome and comfort. Just as the group start to get their bearing a deep rumbling can be heard swiftly coming towards them. In a panic Penelope draws upon her Wild Shape to transform into a fire beetle just as a massive rolling city on treads jumps the hill nearby! Everyone tries to dodge but Penelope is hit by one of the treads and is injured, knocking her out of her beetle shape. This fantastic moving city grinds over the portal, destroying it before it heads off, rolling in a different direction then the tracks of the townsfolk that lead into the swamp. From the mud comes a gargling voice, which asks “Hey, is everyone OK?”. 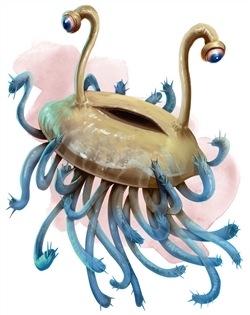 A kuo-toa appears calling himself Rarv bursts from the mud, says that he was hiding watching the group to make sure it was safe, but got concerned that Penelope was injured. Rarv explains a few things about this strange new world the party has found themselves in. First, there are cities on tracks run by gnomes using a magic they call "tek-ology," but Rarv hates them because the gnomes are so stuck up. The people of Fallcrest the heroes are searching for were taken by grimlocks, horrible creatures with no eyes that capture other creatures to use as food. 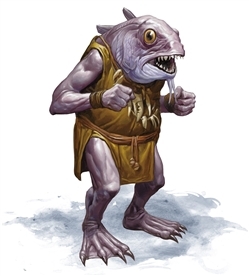 The grimlocks work for "squidfolk," possibly the illithids that Alyndra spoke of before. There is also a cruel black dragon that wants total control over the swamp. Suddenly, another figure appears! The Flumph from the Cloakwood has tagged along with Briv and now settles on his shoulder! Briv names him Phlo-Sho-Lo, and is excited to have a pet! Rarv urges the party to join him back at his village. They are wary, but decide to follow him in order to see how they can help. The village has thousands of kuo-toa all preparing for a festival in the center of town. They are building a massive wicker totem with monster parts woven into it. Rarv explains that they have been working night and day to construct it in order to create and summon a god. They hope this god will destroy the black dragon terrorizing the swamp. Nearby are many of the captured Fallcrest townsfolk held in cages, and Rarv says they are to be sacrifices to help summon this new god. Everyone tries to convince Rarv against this course of action. Briv threatens the whole town, running up to smash and try to knock over the statue. Orkira tries to convince them to convert to Pelor saying they do not need to wait for a new god when she has proof of one who is happy to help immediately, creating fire in her hand while Keen activates his green-flame blade. Alyndra and Penelope try to appeal to Rarv’s better nature, begging to find another way. Tune in February 6th to see how our Heroes face down this kuo-toa god!